There are a ton of things to consider when it’s time to replace the old windows in your home. The design and look of the window, versus the materials and performance need to be considered. Generally speaking you should only need to replace the windows in your home once, so it will be important that you choose a window you’ll be happy with for a long time. DOUBLE-HUNG- The most popular style of window- featuring two sashes that operate up and down, while each sash tilts in easily to clean. CASEMENT-Generally the most efficient window- Hinged on either the left or right side of the window, these windows crank out from an interior crank. BOW- 4 or more equal section windows form a curved window. Generally the windows on the farthest sections on the right and left (vents) operate via casement or double-hung configuration. BAY- 3 sections with a large center picture window. Again the vents usually operate via casement or double-hung configuration. GARDEN- Similar to a bay or bow in that the window projects out from the wall- these windows are constructed of mainly glass- including the roof. Great for growing herbs or small house plants. AWNING- Operates similar to a casement, but these windows are hinged at the top. PICTURE- A solid piece of glass without operating hardware. 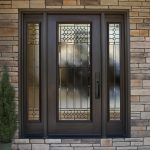 Wood and vinyl have been the most popular materials for windows for a long time. Today the vinyl windows will be more efficient, boasting more air-tight ratings and offering the most efficient glass packages. Wood windows offer a natural wood finish that can be stained or painted. GLASS- The construction of the glass package has the biggest impact on energy-efficiency. For example a double-pane glass unit preforms much better than a single pane unit. ENERGY-EFFICIENCY- Ratings such as U-factor, and Solar Heat Gain can give you a good idea of how your new windows will perform in your home. Taking a look at the ratings versus the guidelines established for our area from EnergyStar can give you a good expectation for how the new windows will impact your homes efficiency. SOUND RATINGS- Most of the windows we sell include a foam filled frame, and foam spacer system. The foam helps dampen sound quite a bit- our customers often say that’s the first thing they notice. There are also windows that have been designed specifically to block sound and offer Sound Transmission Control ratings. UV RATINGS- The base glass package that contains LowE/Argon will help quite a bit, but pay attention to the solar heat gain rating to see how UV light impacts the energy efficiency. If you have a room or side of the house that gets especially hot during the afternoon, or if there’s a room with flooring/artwork that you want to protect from fading- there are glass package options to block most of the UV light.